Signature pieces include biker jackets and lace trimmed camisoles as well as, fabulously embellished denim. Perfect for the woman who wants to stay edgy, bold and contemporary. With fun touches such as embroidery, ruffles, decadent bead work and glitter – MAT. is made for the woman who is not afraid to shine. 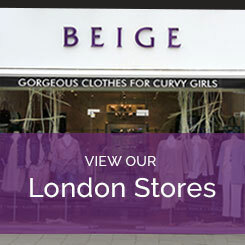 Beige Plus is one of the few multi-brand plus size retailers with both online and bricks and mortar stores. We carry one of the UK’s biggest selection of designer luxury plus size brands. We are proud to include MAT. Fashions in our incredible list of suppliers. Should you require any advice on putting together your look contact customer services on 020 8455 005 or visit one of our London boutiques where our trained stylist will help you create an outfit.